Enjoy light trekking through UNESCO protected Jatiluwih rice terrace in a local way on this private full-day tour. Your private guides - true Balinese farmers - will introduce you to the traditional local pace of life, gardening traditions and tell you all about the fruits growing in the rainforest. 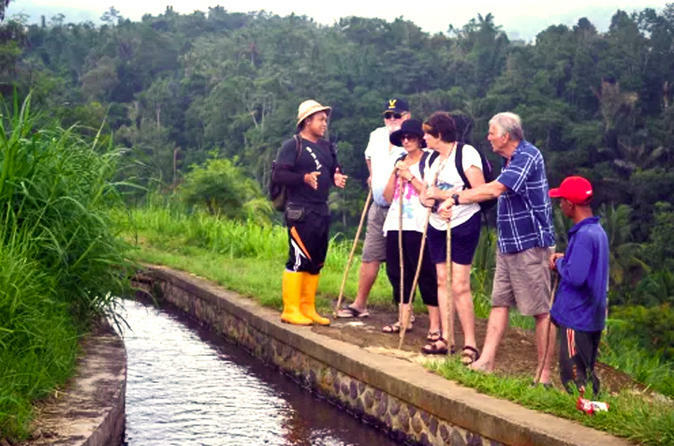 There is no better way to explore the most beautiful Jatiluwih rice terraces in Bali and experience the local way of life than joining this nice eco-tour with local farmers. Along this memorable walk you will be accompanied by local farmers, well-trained in both gardening and trekking. They will share their knowledge about the most amazing traditional paddy planting systems, the Subak of Bali and local farming, introducing you to the plants and fruits growing in the forest. The location itself could not be better - Jatiluwih village. Designated as a part of a World Heritage Site, it exemplifies the properly preserved Bali's cultural and ecological landscape in the form of intact SUBAK institutions, the temples network of Batukaru area and the modesty of people's daily life. With this walk, you will also experience the lived philosophy of Tri Hita Karana, the Three Causes of Goodness and Prosperity. The mainly farming population of Jatiluwih believes that prosperity and goodness can only be gained if we live in harmony with the gods (Parhyangan), with fellow humans (Pawongan), and with nature (Palemahan).